Perfect Wedding Band is Over! MICHIGAN's ELITE WEDDING AND EVENT ENTERTAINMENT! "Changing the World with Other Peoples' Music!" 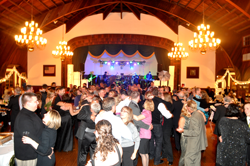 56DAZE is the Michigan Wedding Band of choice of many Michigan couples for their wedding reception entertainment. In 2014, 2015, 2016, 2017 and again for 2018, 56DAZE was honored to have been selected as a top Michigan Wedding Entertainment Vendor by The Knot wedding magazine as voted on by Michigan brides and grooms. We also aquired the KNOT HALL OF FAME award for having achieved a best of weddings pick for 5 consecutive years! 2012 was our first year to earn the Bride's Choice award from www.WeddingWire.com. We are happy to say we also won in 2013, 2014, 2015, 2016, 2017 and again for 2018! NO TRICKERY! These video clips were are all recorded LIVE from the vantage point of a single camera and microphone. There is no editing or overdubs. This is an example of exactly what your event might look or sound like when 56DAZE is performing. It is also a great representation of how your guests might interact with us. Specializing in Weddings and Corporate events by providing high energy live entertainment, 56DAZE is a crowd favorite among Michigan bands. Performing all styles of music to rave audiences in Detroit, Ann Arbor, Lansing, Traverse City, Petoskey, Grand Rapids, Battle Creek, and all across Michigan. 56DAZE's show is an exciting combination of classic rock, Motown, oldies, rock and roll, country, 80's rock and pop, plus all the most up to date dance music. 56DAZE travels statewide across Michigan to play countless events including weddings, corporate events, festivals, reunions, and social soirees. Many of our clients hire 56DAZE year after year for their important events such as fundraisers, community concerts, and holiday parties.